Check out Tobi's Ed High Waisted Crop Pants Update your workwear with the Ed High Waisted Black Crop Pants. These cropped pants feature a high waisted construction and a relaxed fit. Perfect for slaying in the office, pair these capri pants with a fitted blouse and mules. 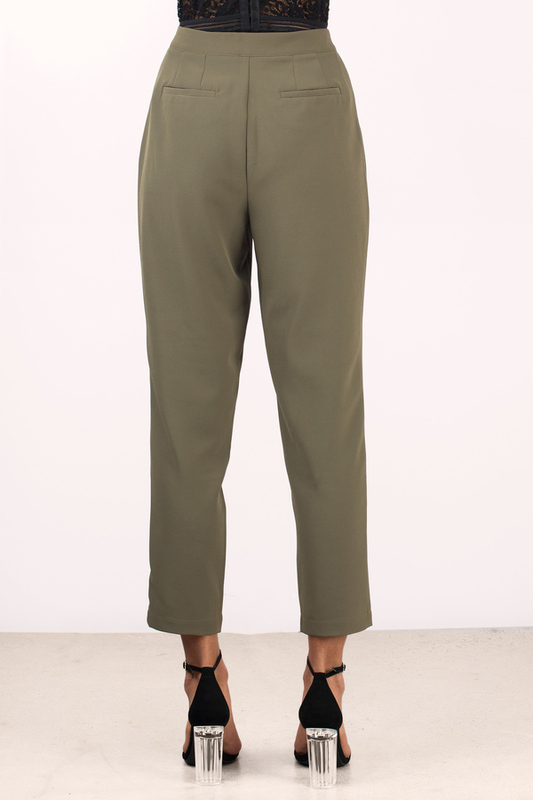 Update your workwear with the Ed High Waisted Olive Crop Pants. These cropped pants feature a high waisted construction and a relaxed fit. Perfect for slaying in the office, pair these capri pants with a fitted blouse and mules. Update your workwear with the Ed High Waisted Black Crop Pants. These cropped pants feature a high waisted construction and a relaxed fit. Perfect for slaying in the office, pair these capri pants with a fitted blouse and mules.